Once again, we (my Gentile-Christian-members-of-the-body/assembly-of-Messiah-Yeshua family), are not lighting a chanukiah this year at Hanukkah. Exodus 25:37 "And thou shalt make the lamps thereof, seven: and they shall light the lamps thereof, to give light over against it." 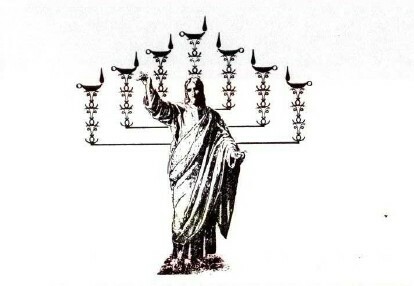 The Chanukiah has a total of nine lamps. Deuteronomy 4:2 "Ye shall not add unto the word which I command you, neither shall ye diminish from it, that ye may keep the commandments of Jehovah your God which I command you." Thankfully, Gracefully, Christians are not under the Mosaic law. Romans 6:14 "For sin will not exercise-lordship of-YOU; for YOU-are not under law BUT under favor." Colossians 2:16 "Let not therefore anyone be-judging YOU in eating and in drinking or in part of-(a)-feast or of-(a)-new-moon or of-sabbaths"
While this verse does not directly address Hanukkah, the surrounding context would seem to apply to this man-made celebration. Likewise the context of Roman ch6 dictates that we use discernment regarding our actions, devoting ourselves to holiness. Romans 616 "Are-YOU not knowing-absolutely that to-whom YOU-are-devoting yourselves slaves with-reference-to obedience, YOU-are slaves to-whom YOU-are-obeying, either-indeed of-sin with-reference-to death or of-obedience with-reference-to righteousness?" The chanukkiah is a non-biblical variant of the lampstand/menorah shown to Moses. The earthly lampstand is patterned off the heavenly lampstand, and thus it's design should not be altered (even if it is fun for the kids to light). Hanukkah should not become a devoted thing. 4 And on-the-one-hand they-will-turn-back the hearing from the truth, on-the-other-hand they-will-be-diverted upon the legends." John 8:12 "Again therefore the Jesus spoke to-them, saying, I myself-am the light of-the world; the (one) following me will by-no-means walk-around in the darkness, BUT he-will-have the light of-the life." v25 “The Jesus answered to-them, I-said to-YOU, and YOU-are not trusting. The works which I myself-am: doing in the name of-my Father, these-(things) (are)-bearing-witness concerning me;"
v26 BUT YOU yourselves-are not trusting. For YOU-are not out-of the sheep namely-the mine, according-as I-said to-YOU. Note that Jesus is defining something completely different than Temple Judaism or Rabbinical Judaism, and that this always greatly upset the Jews, even to this day. v28 And-I myself-am-giving life eternal to-them; and by-no-means might-they-perish with-reference-to the age, and not anyone will-seize them out-of my hand. v29 My Father who has-given-and-is-still-giving to-me is greater (than)-all, and no-one is-being-able to-be-seizing out-of the hand of-my Father. v31 "The Jews therefore again bore stones in-order-that they-might-stone him." What an un-happy bunch of Hanukkah celebrants! They wanted to kill him! Obviously Jesus was not celebrating with them. A most serious question: At Hanukkah, are you being crucified with the Messiah, or are you crucifying the Messiah again? Living the spiritual life is more difficult than seeing it; there is no need to place a chanukkiah in front of the Lampstand in our hearts (1Cor.3:16). 1 Corinthians 3:16 "Are YOU not knowing absolutely that YOU are the sanctuary of the God, and the spirit of God is dwelling in YOU?" Again, this dictates that the Temple service (as at Heb.7:11) has changed. What a beautiful Light! What a peaceful place to be. 13 And in the midst of-the lampstands (one) like (a) son of-MAN, having-been-and-still-clothed-in (a garment) to-the-feet and having-been-and-still-girded-around at the breasts (with a) belt [girdle] made-of-gold;"
With that view we celebrate the true Light - Yeshua - in the sanctuary of God. Conclusion: As such, it is apparent to me that Jesus did not celebrate Hanukkah with the Jews, and so I’m hesitant to participate in the traditional legend (2Tim.4:3). But Col.2:16 allows - seems to allow - for a part-taking, and moreover, a good view during Hanukkah is seeing Yeshua in the midst of the Seven Assemblies (Rev.1:12-13). As per 1Cor.3:16, I wish you a Happy Midst-of-Lampstands. Shalom always in Messiah. Some edits in red type have been added to clarify/distinguish that Jesus/Yeshua is the true light, and that the Lampstand of the tabernacle & temple were only a shadow of that Light, and that the chanukiah (with its nine branches) is a much later tradition/legend of man. "I don't care if every Gentile in this empire has obeyed the king and yielded to the command to abandon the religion of his ancestors. My children, my relatives, and I will continue to keep the covenant that God made with our ancestors. With God's help we will never abandon his Law or disobey his commands. We will not obey the king's decree, and we will not change our way of worship in the least." A.V. 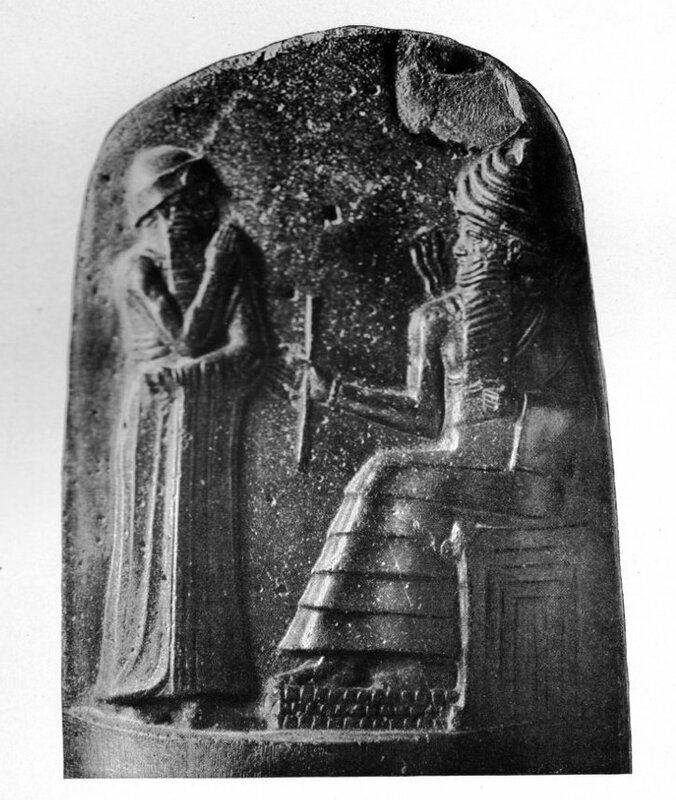 vs22 - "We will not hearken to the king's words, to go from our religion, either on the right hand, or the left." Hab 2:4 Behold, his soul is puffed up, it is not upright in him; but the righteous shall live by his faith. Mathathias' is --perhaps -- speaking in/of/from the heart - in faith/trust. It is fitting thinking for Hanukkah. "Then Mathathias answered, and said with a loud voice: Although all nations obey king Antiochus, so as to depart every man from the service of the law of his fathers, and consent to his commandments: 20 I and my sons, and my brethren will obey the law of our fathers." Make no mistake here, Yeshua didn't error in his zeal for his Father's house and "go too far" and accidentally stop the Levites from carrying (and thus performing) sacrifices. No, Jesus is God: He doesn't make mistakes. He doesn't do things without reason, without LOGIC (logos). It occurs to me in reading in 1 Macc. ch 2&4 and 2 Macc. ch2 regarding their hope of future mercy and salvation that Mathathias & Judas, etc, even as they restored the Temple, were ready for the Messiah to come and "stop" the Temple sacrifices as per Jer.31:32. That's big hearted faith, and a good thought for Hanukkah. "'stop' the Temple sacrifices as per Jer.31:32." ??? Yes, Jesus stopped the Levitical temple service. He initiated a New Covenant (Lu.22:20), not according to the Sinai Covenant (Jer.31:32 - Heb.8:13). This is in effect now (2Cor.3:2-6) but national Israel has been blinded for a time (Ro.11:7-10,25,26), but Jer.31:31-34 will be fulfilled for them also - in their heart also - and then "how much more their fulness"(Ro.11:12). Yet today, Yeshua is our (believers) Sabbath rest (Heb.4:3). 3. He spoke trusting that the promises of a New Covenant of a future time. That is, he spoke of Jeremiah 31:31-36...that God would write His law on his (Mathathias' ) heart and then - and only then - he would be able to obey God. I used to think #3 is a good possibility and now I think #3 is a good hope... we don't know the hearts of men. Obviously, Yeshua didn't mistake a Maccabbee as the Messiah, and neither do we. It seems that for Jews today, Hanukkah is a means of further distancing themselves from Yeshua the Messiah. Believers in Messiah Yeshua/Jesus need to be careful to support and love the blinded-by-God-Israel (Rom.11:28-31), but we must be more careful not to diminish the sacrifice of Yeshua (Heb.10:29). "Saying" that you will make Hanukkah about Yeshua is not a lot different than saying you will make Christmas (Saturnalia) about Jesus. You are not changing the historical background of the customs, but merely adapting them, which is what the Roman Catholic Church has been errantly doing all along. Christians and/or Messianics and "Messy-antics" should study this history and compare with what the scriptures gives as the feasts. 4 And on-the-one-hand they-will-turn-back the hearing from the truth, on-the-other-hand they-will-be-diverted upon the legends. Jer. 31:32 "not according to the covenant that I made with their fathers in the day that I took them by the hand to bring them out of the land of Egypt; which my covenant they brake, although I was a husband unto them, saith Jehovah." Ezk.36: 26 A new heart also will I give you, and a new spirit will I put within you; and I will take away the stony heart out of your flesh, and I will give you a heart of flesh. Of course we Christians now have it relatively easy, with the New Testament/Covenant writings AND the Holy Spirit to explain things therein. Where previously the law was a disciplinarian tutor, now that trust has come we are no longer under a disciplinarian tutor (Gal.3:24-25). We have graduated from law school! Now the Holy Spirit teaches - in the heart (Jn.14:26, 1Cor.2:13). v38 But if I-am-doing, even-if YOU-might not be-trusting me, YOU-trust in-the works, in-order-that YOU-might-come-to-know and You-might-trust that the Father (is) in me, and-I in him." Matt.27:50 "But the Jesus having-cried again with-a-great voice he-let-go the spirit. v51 And behold the veil of-the sanctuary was-split into two, from from-above till below; and the earth was-caused-to-quake, and the rocks were-split,"
1 "And he showed me Joshua the high priest standing before the angel of Jehovah, and Satan standing at his right hand to be his adversary." Apparently there are different LXX versions of this verse. "και έδειξέ μοι κύριος Ιησούν τον ιερέα τον μέγαν"
"and showed me - YHVH YESHUA - the priest the great"
The LXX Greek is consistent in its treatment of the Tetragrammaton: Kurios without the Greek definite article is YHVH. Compare Isa.40:3 & Mt.3.3, where the LXX's faithful witness verifies the New Testament Greek's affirmation that Jesus is Jehovah. At least three groups are looking at this prophecy: Us, those in Jesus' day, and those before his "day". Zec 3:2 (ASV) "And Jehovah said unto Satan, Jehovah rebuke thee, O Satan; yea, Jehovah that hath chosen Jerusalem rebuke thee: is not this a brand plucked out of the fire? 4 And he answered and spake unto those that stood before him, saying, Take the filthy garments from off him. And unto him he said, Behold, I have caused thine iniquity (ἀνομίας) to pass from thee, and I will clothe thee with rich apparel." N.T.- John 19:2 (ASV) ....and arrayed him in a purple garment (ἱμάτιον himation) . and some extravagant, representing purity. O.T. -Zechariah 3:4 (LXX)" ...Take away the filthy raiment (ἱμάτια himatia) from him. And he said to him, Behold, I have taken away thine iniquities (ἀνομίας anomias): and clothe ye him with a long robe (ποδήρη pod-ay'-race), and place a pure miter upon hi head." N.T.- Luke 23:11 (KJV) "And Herod and his men of war set him at nought, and mocked him, and arrayed him in a gorgeous (λαμπρός lampros) robe (ἐσθής esthēs), and sent him again to Pilate." [note: λαμπρός lampros brilliant shining white - the light of the world!. This was an extremely expensive robe that Pilate took as a gift from Herod, hence they became friends that day - vs 12. Zec 3:5 "And I said, Let them set a clean mitre upon his head. So they set a clean mitre upon his head, and clothed him with garments; and the angel of Jehovah was standing by." And this points to a High priest-king. Of course we see the crown of thorns (Mt.27:29) and his crown in glory (Rev.14:14). Mathathias may or may not have seen this and trusted, but he also had the witness, or gospel of/in the stars to ponder (Ps.19:1). Certainly the Magi were correctly led by the stars to Jesus (Mt.2:1,9). I'll note that the constellation Corona is named "Atarah" in Hebrew...and so we dwell in the shadow of His wings...Ps.104:1b-2 (NSAB): "You are clothed with splendor and majesty, Covering Yourself with light as with a cloak (LXX ιμάτιον - himation), Stretching out heaven like a tent curtain. ( יְרִיעָה yĕriy`ah)"
Gesinius's Lexicon: "a veil, curtain, so called from tremulous motion. - - the curtain of a tent, and the tent itself"
This same word (יְרִיעָה yĕriy`ah) is used in Ex.26:1, which defines the Tabernacle of the Wilderness as - the ten curtains that were over the board structure. Young's Literal Translation is the only translation I could find that correctly does not add the word "with": " And thou dost make the tabernacle ten curtains (יריעת yĕriyot) of twined linen, and blue, and purple, and scarlet; with cherubs, work of a designer, thou dost make them;"
IF Jesus wore a tallit, then he apparently left it at the tomb (Jn. 20:5-7), but there is a greater covering over those that trust in him, the shed blood of Messiah Jesus (Lev.17:11 - Ro.3:24,25 - 1Jn.1:7); That veil was his flesh (Heb.10:19-20), we have access into His rest now, at this time (Heb.4:3). Praise Yah. 7 Thus saith Jehovah of hosts: If thou wilt walk in my ways, and if thou wilt keep my charge, then thou also shalt judge my house, and shalt also keep my courts, and I will give thee a place of access among these that stand by. 8 Hear now, O Joshua the high priest, thou and thy fellows that sit before thee; for they are men that are a sign: for, behold, I will bring forth my servant (עֶבֶד `ebed) the Branch. (צֶמַח tsemach )* "
Yeshuwa`, the shortened form of יהושוע Yĕhowshua`. Compare יֵשׁוּעַ Yeshua` at Ezra 3:8 " Jeshua the son of Jozadak". There is "room" here to see Joshua as a type of Messiah, the High Priest King, at least in some of these verses. Within the Prophecy of Zechariah, it seems likely possible that Mathathias and Judah (@Maccabees) would have known both the Hebrew and Greek (via LXX) names of the promised Messiah. It also seems likely that the Jewish rulers and scribes at the time of Jesus would have been well aware of this prophecy and these names. * my servant the Branch - Of course, we can see *Yeshua/Jesus as my servant the Branch here. But Zechariah isn't talking about Hanukkah. - On Hanukkah, Jews and many Messianics light candles or lamps on a special lampstand called a chanukkiah. There are eight lamps or candles for the eight days of Hanukkah, and each night a "new" lamp/candle is lit with a separate (ninth) candle that is usually located in the center of the lampstand. The Hebrew name for this candle/lamp/light is "the Shamash"; "shamash" also means "servant". Note that the chanukkiah, and Hanukkah for that matter, are not biblically commanded. The biblically commanded Lampstand had SEVEN lamps (Ex.25:37), not nine. -- As Paul, whatever it takes to get people to look at the true Light (Jesus) (1Cor.9:20-24). If it takes Hanukkah to get someone to consider The One in the midst of the lampstand, then OK - "But we-are-knowing-absolutely that to-the (ones) cherishing the God all-things are-working-together with-reference-to good, to-the (ones) being called according-to plan" (Ro8:28). The Light of the World. The true miracle, yes, -- but not of Hanukkah. Revelation 1:14 "But his head and the hairs white as wool white as snow, and his eyes as (a) flame of-fire. v15 And his feet like to-chalcolibanus as having-been-and-still-on-fire (from) in (a) furnace, and his voice as (a) noise [voice] of-many waters. v16 And holding in his right hand seven stars, and out-of his mouth (a) sharp two-edged sword proceeding-out, and his countenance as the sun appearing in its power. v18 And the (one) living, and I-became dead and behold I-am living into the ages of-the ages, and I-am-having the keys of-the death and of-the hades. v20 The mystery of-the seven stars which you-saw on my right (hand), and the seven lampstands, namely-the (ones) made-of-gold. The seven stars they-are messengers of-the seven assemblies, and the lampstands they-are the seven assemblies." Zec 3:9 "For, behold, the stone that I have set before Joshua; upon one stone are seven eyes: behold, I will engrave the graving thereof, saith Jehovah of hosts, and I will remove the iniquity of that land in one day. " Rev. 5:6 "And I-saw in midst of-the throne and of-the four living-creatures and in midst of-the elders (a) lamb having-stood-and-still-standing as having-been-and-still-slain, having seven horns and seven eyes, which are the seven spirits of-the God having-been-and-still-dispatched into all the earth." Zec 3:10 "In that day, saith Jehovah of hosts, shall ye invite every man his neighbor under the vine and under the fig-tree." "1 And the angel that talked with me came again, and waked me, as a man that is wakened out of his sleep. 6 Then he answered and spake unto me, saying, This is the word of Jehovah unto Zerubbabel, saying, Not by might, nor by power, but by my Spirit, saith Jehovah of hosts. 7 Who art thou, O great mountain? before Zerubbabel thou shalt become a plain; and he shall bring forth the top stone with shoutings of Grace, grace, unto it. " David L. Cooper explains: "We know that candlesticks and all types of lamps are used for the purpose of giving light where there is darkness. Naturally therefore one concludes that the candlestick here signifies that which gives light in darkness. This idea is confirmed by an examination of the first chapter of the Book of Revelation. There John was given a vision of seven golden candlesticks in the midst of which the glorified Son of Man was walking. He was informed that they signified or represented the seven churches of Asia. Thus those seven local congregations gave forth the light of truth in the heathen darkness about them. Since the church during this age is functioning as Israel did in the Mosaic economy, we may be certain that the candlestick which was first in the Tabernacle and later in the Temple signified, Israel, who gave forth the light of the Word of God to the heathen world during that time. But the candlestick as it was in the Jewish economy had to be cleansed and the oil replenished daily. This fact signified the imperfection of Israel during that time. In order to give forth light, there was the necessity for constant attention. But this candlestick is an improved one, being connected with an inexhaustible supply of the oil which was burned to give the light. This oil comes from olive-trees connected by pipes to the candlestick. This arrangement therefore signifies that there will be a change in Israel's condition and that she will at some time be thus connected with the inexhaustible supply of that which enables her to shine with uninterrupted splendor. These facts therefore present us with a prediction that at some time in the future Israel will be thus connected with God, the source of all light, and Messiah in such a way that she can give forth the light of His truth with uninterrupted blessing." 13 even he shall build the temple of Jehovah; and he shall bear the glory, and shall sit and rule upon his throne; and he shall be a priest upon his throne; and the counsel of peace shall be between them both." Mark 11:16 "And he-was not letting-be in-order-that any-one might-bring-through (an) article through the temple." John 10:25 "The Jesus answered to-them, I-said to-YOU, and YOU-are not trusting. The works which I myself-am: doing in the name of-my Father, these-(things) (are)-bearing-witness concerning me;"
John 2:19 "The Jesus answered and said to-them, YOU-break-down this sanctuary, and in three days I-shall-raise it. v20 The Jews therefore said, In forty and six years this sanctuary was-built, and you yourself-will-raise it in three days? v21 But that (one) was-saying concerning the sanctuary of-his body. v22 When therefore he-was-raised out-of dead (ones) his disciples were-made-mindful that he-was-saying this to-them, and they-trusted the scripture and the word which the Jesus said." 1 Corinthians 3:16 "Are YOU not knowing absolutely that YOU are the sanctuary of the God, and the spirit of God is dwelling in YOU?" This is the "Christ in you." v27 To-whom the God willed to-make-known what the riches of-the glory of this mystery among the Gentiles, which is Messiah in YOU, the hope of-the glory;"
Ephesians 2:13 "But at-this-instant in Messiah Jesus YOU, the (ones) at-one-time being far (away), YOU-became near in the blood of-the Messiah. v15 Having-rendered-inactive the law of-the commandments in decrees, in-order-that he-might-create the two [Jew and Gentile] in himself with-reference-to one new (quality) MAN making peace,"
2 Corinthians 5:17 "So that if anyone (is) in Messiah, (he-is) (a) new-quality creation; the ancient-things went-past, behold the all-things have-become-and-still-are new-quality." John 15:3 "Already YOU yourselves-are clean (ones) because-of the word which I-have-spoken-and-am-still-speaking to-YOU. v4 YOU-remain in me, and-I in YOU. According-as the vine-branch is not being-able to-be-bringing fruit from itself unless it-might-remain in the vine, thus neither YOU unless YOU-might-remain in me. v5 I myself-am the vine, YOU the branches. The (one) remaining in me, and-I in him, this (one) is-bringing much fruit; because separate-from me YOU-are not being-able to-be-doing anything." Going over Eph.2:14-15: vs 14, note the two (places) become one when the middle partition is rent. This allows for both Jew and Gentile to become one new man (Eph.2:15). It seems that this important distinction is missed in both the "Christian" and "Messianic" assemblies. I understand that this is not the generally accepted interpretation, but pray and think on this. "It might be of interest to note that the height of the board structure is given as 10 cubits. The total length can be figured, 20 boards each 1 1/2 cubits wide, or 30 cubits. There is, however, no record of the length of the holy place, or the holy of holies. This is striking and important, for the entire structure had to be moved. Except on the day of atonement, no one could ever enter the holy of holies, neither were the people permitted to see the ark of the covenant. How could the ark be moved; first, without anyone seeing it and; second, without anyone going into the holy of holies to get it? The first part was easy. The veil was used as a cover for the ark. The priests lowering the veil and yet keeping it above their heads, could walk forward without seeing the ark and cover it. (Num. 4:5) But were they not going into the holy of holies? The answer is definitely, No. The veil, not the pillars, separated the holy place from the holy of holies, and as the veil was moved forward, the holy of holies became smaller and the holy place larger. Now, you see why no length dimensions are given for the holy of holies; it was variable. With the veil around the ark, the holy of holies was, in effect, the ark itself." The Law - the NEW law of Messiah (Jn.15:12) - is now written in our hearts - we are an epistle of Messiah. v3 (Ones)-being-manifested that You;-are (an) epistle of-Messiah ministered by us, having-been-written-and-still-written not with-black-ink BUT with (the) Spirit of-(the)-living God, not in flat-tablets of-stone BUT in flat-tablets (of) fleshy hearts. v4 But we-are-having reliance such-as-this through the Messiah toward the God. v6 Who also made us adequate ministers of-(a)-new-quality covenant, not of-letter BUT of-spirit; for the letter is-killing, but the spirit is-making-alive." The "Killing Letter" here in vs. 6 is the Sinai Covenant. Yes, Jesus stopped the Levitical temple service. He initiated a New Covenant (Lu.22:20), not according to the Sinai Covenant (Jer.31:32). This is in effect now (2Cor.3:2-6) but national Israel has been blinded for a time (Ro.11:7-10,25,26), but Jer.31:31-34 will be fulfilled for them also - in their heart also - and then "how much more their fulness"(Ro.11:12). Yet today, Yeshua is our (believers) Sabbath rest (Heb.4:3). Again going back to the original thought here: Mathathias said " I will continue to keep the covenant that God made with our ancestors." (1Macc.2). 2. He spoke trusting that the temple service/order would be restored (as by his son Judas), that is, he spoke prophetically. I think #3 is a good possibility. Learning Edit: I think #3 is a good hope... we don't know or judge the hearts of men. Again, obviously, Yeshua didn't mistake a Maccabbee as the Messiah, and neither do we. It seems that for Jews today, Hanukkah is a means of further distancing themselves from Yeshua the Messiah. Believers in Messiah Yeshua/Jesus need to be careful to support and love the blinded-by-God-Israel (Rom.11:28-31), but we must be more careful not to diminish the sacrifice of Yeshua (Heb.10:29). Should we celebrate a Pharisaic rewrite of Maccabean theology and rule that resulted in Jews killing Jews? Is it ok if we say "only if they killed Greeks or Romans"? Who destroyed the Temple, God or the Romans? That is, should we celebrate Hanukkah if it is in the spirit of rebuilding the physical "third" temple on earth? NO. 1 Corinthians 3:16 - the sanctuary of the God is in you (those that trust in Yeshua). Study the Word. Use discernment. Prayer required. And again PERHAPS a situation will allow us, as Paul, to do whatever it takes to get people to look at the true Light (Jesus) (1Cor.9:20-24). If it takes Hanukkah to get someone to consider the one in the midst of the lampstand, then OK - "But we-are-knowing-absolutely that to-the (ones) cherishing the God all-things are-working-together with-reference-to good, to-the (ones) being called according-to plan" (Ro8:28). On the other hand, 1 Cor.3:16 is not yet applying to those JEWS that do not yet trust in Messiah Jesus. They may well indeed continue to look for the Messiah, even in a third physical temple...and this is hopeful. Romans 11:29 For the bestowed-favors and the calling of-the God (are) unregrettable. v30 For as-altogether YOU yourselves at-one-time disobeyed the God, but now YOU-had-mercy-bestowed in-the disobedience of-these. v31 Thus these also now disobeyed in-order-that by your mercy they themselves also might now have-mercy-bestowed. v32 For the God shut-together all the (ones) with-reference-to disobedience in-order-that he-might-have-mercy (on) all the (ones). v33 O depth of-God's riches and wisdom and knowledge; as unsearchable his sentences and untraceable his ways. v34 For who came-to-know (the) mind of Jehovah? Or who became his fellow-counsellor? v35 Or who gave-before to-him, and it-will-be-repaid to-him? v36 Because out-of him and through him and with-reference-to him (are) the all-things; to-him (be) the glory with-reference-to the ages: Amen. aside: It's probably a good idea to keep the possibility of the white horse rider recorded in II Maccabees 3:26,27 and 11:5-33 open (in our minds) as possibly the white horse rider of Revelation 6:1,2. This could also be a false horse rider. See Apologetics 40 "4-SEALS", by R.H. Mount. Link: http://www.cotopaxi-colorado.com/BIBLE/MOUNT-APOLOGETICS/Apologetics%2040%20-%204%20Seals.PDF -Sorry, no online audio to this lesson available yet. John 6:29 " The Jesus answered and said to-them, This is the work of-the God, in-order-that you-might-trust with-reference-to whom that (one) dispatched." Our Trust is our work. 1 John 4:19 We ourselves-are-cherishing, because he himself first cherished us. Again: The work of God is that He loved us first so that we might love and so it is only in HIS love to us that our trust is allowed. And yes, the context of the passage shows that this trust is also the work that we are to do..
John 3:16 For thus the God cherished the world so-that he-gave his son, namely-the only-begotten, in-order-that every-(one) the (one) trusting with-reference-to him might not perish, BUT he-might-be-having life eternal. .God loved first. Note especially that "cherished" is past tense. John 3:21 But the (one) doing the truth is-coming to the light, in-order-that his works might-be-manifested that (they-are) having-been-worked in God. 1John 2:5 But who might-be-keeping his word, truly in this (one) the charity of-the God has-been-made-perfect-and-is-still-perfect. In this we-are-coming-to-know that we-are in him. The Jesus answered and said to-them, This is the work of-the God, in-order-that you-might-trust with-reference-to whom that (one) dispatched. The "works" that we do is our Trust, not our keeping of commandments. God is Spirit; we worship in Spirit. Our work is Spiritual, not physical. 1 John 4:9 In this the charity of-the God was-manifested in us, because the God has-dispatched-and-is (completing? )-the-dispatch of-his son namely-the only-begotten into the world in-order-that we-might-live through him. v10 In this is the charity, not that we ourselves-cherished the God, BUT that he himself-cherished us and he-dispatched his son (a) propitiation concerning our sins. v11 Cherished (ones), if thus the God cherished us, we ourselves also are-being-indebted to-be-cherishing one-another. v12 And-not-one at-any-time has-beheld-and-still-beholds God; if we-might-be-cherishing one-another, the God is-remaining in us and his charity is having-been-and-is-still-made-perfect in us. v13 in this we-are-coming-to-know that we-are-remaining in him and he in us, because he-has-given-and-still-is-giving to-us out-of his Spirit. v15 Who if he-might-confess that Jesus is the son of-the God, the God is-remaining in him and he in the God. v16 And we ourselves-have-come-to-know-and-still-know and we-have-trusted-and-still-trust the charity which the God is-having in us. The God is charity, and the (one) remaining in the charity he-is-remaining in the God and the God is-remaining in him. v17 in this the charity has-been-and-still-is-made-perfect with us, in-order-that we-might-be-having boldness-of-speech in the day of-the judgement, because according-as that-(one) is even we ourselves are in this world. v18 Fear is not in the charity, BUT the perfect charity is-casting the fear without, because the fear is-having punishment, but the (one) fearing-for-himself has-not-been-and-is-not-made-perfect in the charity. v19 We ourselves-are-cherishing, because he himself first cherished us. John 14:15 If YOU-might-be-cherishing me, YOU-keep the commandments namely-the (ones) mine. There is a subtle, but huge difference in seeing that as a commandment vs. a proclamation by Yeshua. Much comfort is found in this via the great mystery of Eph. ch.5, where the MAN (Messiah) does all the work, and cleaves to the woman (the assembly) and by His work, the two are ONE/echad. The ONLY way His commandments are not grievous ("who then can be saved???") is the fact that YHVH's presence, His Spirit, His Love in us is what/whom "keeps" the commandments. All the glory is YHVH's. It is HIS work whereby we are saved, and even whereby we "keep" His commandments. With man, keeping the commandments is impossible. Hebrews 4:3 "For we, the (ones) having-trusted, are-going-in into the rest, according-as he-has-said-and-still-says: As I-swore in my wrath; if they-will-go-in into my rest; and-yet of-the works having-been-come-to-pass from casting-down of-(a)-world." John10:22 But the dedication(s) (ἐγκαίνια egkainia) came-to-pass in the Jerusalem, and it-was winter. v23 And the Jesus was-walking-around (περιεπάτει peripatā) in the temple (ἱερῷ hiero) in the portico of-the Solomon. First note that "walking-around" is different that "celebrating". If I am walking around Wal-mart when they are selling their Halloween trinkets, that doesn't mean I'm buying what they are selling. I'm not celebrating Halloween. It was the (Jewish tradition of) dedications. In Jerusalem. In winter. i.e. Jesus was going about his Father's business. Luke 2:49 And he-said to-them, Why (is-it) that YOU-were-seeking me? Were-YOU not knowing-absolutely that it-is-essential (for) me to-be in the-(things) of-my Father? So at the Dedication they want him to tell him if he is the Messiah, and he says I already told you, but you don't believe me. John 10:24 "The Jews therefore encircled him, and they-were-saying to-him, Till at-what-time are-you-lifting-up our soul? If you yourself-are the Messiah, you-say-(so) to-us with-boldness-of-speech. v25 The Jesus answered to-them, I-said to-YOU, and YOU-are not trusting. The works which I myself-am: doing in the name of-my Father, these-(things) (are)-bearing-witness concerning me;"
Note that Jesus is defining something completely different than Temple Judaism or Rabbinical Judaism, and that this always greatly upset the Jews. Mark 11:16 " And he-was not letting-be in-order-that any-one might-bring-through (an) article through the temple." What an un-happy bunch of Hanukkah celebrants! Jesus specifically picked the time around the Dedication (Hanukkah) to contrastingly say "NO! I AM the Light! I AM the center of attention in the Lampstands, I am better than the physical temple, its lampstands, or your little chanukkiahs, no matter how great and glorious they appear to you". Jesus is the true Light of the naos/sanctuary. Jesus distinguished himself from the Dedication celebration, just as he made a distinction between the physical Temple and himself. Matthew 27:51 "And behold the veil of-the sanctuary was-split into two, from from-above till below"
That veil was his flesh! Which (entering-in) he-dedicated for-us (a) way recently-slain and living, through the veil, this is his flesh,"
Therefore the veil is spiritual; and so too all the commandments regarding the veil and its related service. Hebrews 13:10 "We-are-having (an) altar out-of which the (ones) serving to-the tabernacle are not having authority to-eat." The sanctuary of God is in the believer. It is important to see in this that Jesus stopped the physical Temple services (Mk.11:16, Jn.2:19-22, Mt.27:51, Heb.10:19-20) - and that includes stopping the physical temple service of a celebration/Dedication. Vicky Dillon's old website comments regarding Hanukkah. I don't celebrate Christmas or Hanukkah, but agree with her commentary regarding the origin of Hanukkah and on the history of the Maccabees. and should be celebrated by those in Hebrew Roots or Messianics instead of pagan Christmas. therefore Messianics and Christians should celebrate it instead of Christmas. The ceremonies are found in the Scriptures.